I am a huge Escape from New York fan. I saw the sequel, Escape From L.A., first when it hit theaters in August of 1996. I was really impressed by the film and wanted to see the original. After leaving the theater, my mother and I went to the mall that was across the street from the movie theater. There was a Suncoast ('member them?) and they were one of the few places around my house that sold laserdiscs. About five minutes later, I walked out of the store with Escape From New York on Laserdisc. This was the edition where the awesome commentary track with John Carpenter and Kurt Russell originated and was one of the reasons I went with the laserdisc over the new "Widescreen Edition" of the film on VHS. I watched the film a few times before the year was ok and still own that disc to this day. The reason I bring all of this up is because of a story I saw over on Dread Central. 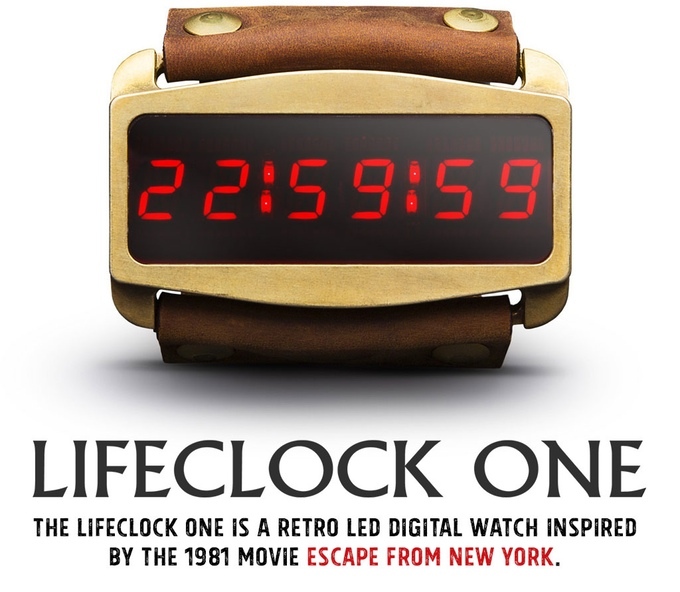 There is a Kickstarter campaign that promises to bring Snake Plissken's countdown watch into reality. I am not the biggest fan of Kickstarters. I have seen way too many promise the heavens and deliver nothing. I have also seen ones that off the same, but deliver a product that is a fraction of what was promised. This watch looks really nice and I would love to have one, but I don't see myself plunking down $249.99 for something that may not happen. However, some of my readers may want to take a chance and that is why I am even talking about this in the first place. 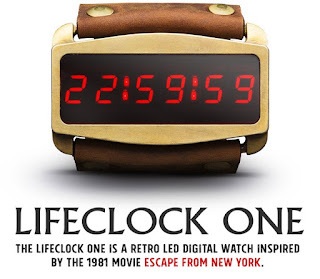 The Lifeclock One is an officially licensed, supercharged version of Snake Plissken’s countdown watch from Escape from New York. In John Carpenter’s famous masterpiece, Escape from New York, Snake Plissken (Kurt Russell), has 24 hours to rescue the President from the country’s largest prison — New York City. The United States Police Force gives Snake a gun, a two-way radio and a countdown watch. The Lifeclock One is a fully licensed reboot of that watch but with a twist — it’s a countdown timer of course, but it also tells the time, date and much more. Best of all — it pairs with your iOS or Android device to give you all of the alerts for all of the cool phone functions that Snake would have killed for — push notifications from your favorite apps as well as incoming call and text message alerts. You also get step counting, weather, world clocks, camera control, stopwatch and much more. The Lifeclock One is a unique watch that’s not only smart but attracts attention. Designed, assembled and tested in the United States, it’s the coolest looking smartwatch you’ll find on the market today. When the Lifeclock One screen powers up, you better not be shy because you’re going to get attention — lots of it. The crisp, vibrant displays will attract the gaze of everyone in the room — and it gets even better at night. LED watches have never looked this cool.